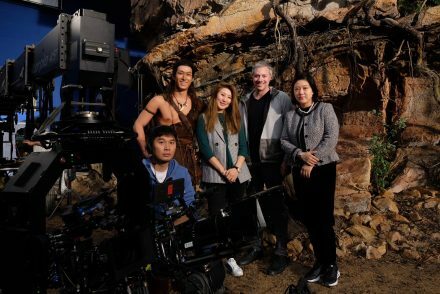 Legend of Sun and Moon (left to right): Danny CHEN (DOP), Shawn DOU (Lead Cast), Eva JIN (Director), Todd Fellman (Producer), Eileen GONG (Producer). Minister for the Arts Don Harwin confirmed that the highly skilled special effects work on the major new Chinese/Australian feature film Legend of Sun and Moon will take place in NSW. The production will spend almost $40 million on post production with NSW companies, including Definition Films, Slate VFX and Big Bang Sound, creating an estimated 250 jobs. The film has been secured for NSW by the NSW Government through its Made In NSW – International Footloose Fund, investing up to $10m in yearly funding to bring the very best in film and television to our shores. “Legend of Sun and Moon is the largest Chinese/Australian co-production to ever have been made and a big coup for the NSW screen industry that 100% of its specialised post work will be completed in the State,” Mr Harwin said. The production will be based at Sydney’s Fox Studios, with notable collaborators including Producer Todd Fellman, Writer and Director Eva Jin, and producers Beaver Kwei and Eileen Gong. Legend of Sun and Moon is an adaptation of the classic tale of Chang-E, Goddess of the Moon and Hou Yi, the heroic archer who shot down nine of 10 suns that were scorching the Earth. Principle filming has just been completed in China.